Even modest temperature rises agreed under an international plan to limit climate disaster could see the ice caps melt enough this century for their loss to be "irreversible", experts warned Monday. The 2015 Paris Agreement limits nations to temperature rises "well below" two degrees Celsius (3.6 degrees Fahrenheit) above pre-industrial levels and to less than 1.5C if at all possible. That ballpark of getting 1.5-2C hotter by 2100 is scientists' best-case-scenario based on our consumption of natural resources and burning of fossil fuels, and will require radical, global lifestyle changes to achieve. For comparison, humans' business-as-usual approach—if we continue to emit greenhouse gases at the current rate—will see Earth heat by as much as 4C. Scientists have known for decades that the ice sheets of Greenland and Antarctica are shrinking, but it had been assumed that they would survive a 1.5-2C temperature rise relatively intact. However, according to a new analysis published in the journal Nature Climate Change, even modest global warming could cause irreversible damage to the polar ice, contributing to catastrophic sea level rises. 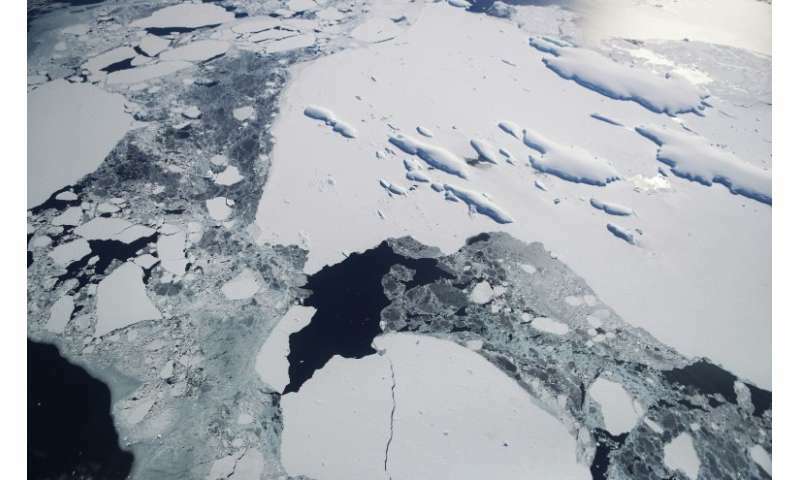 "We say that 1.5-2C is close to the limit for which more dramatic effects may be expected from the ice sheets," Frank Pattyn, head of the department of geosciences, Free University of Brussels and lead study author, told AFP. His team crunched data on annual temperature rises, ice sheet coverage and known melt levels and found that both Greenland and Antarctic ice sheets would reach a "tipping point" at around 2C. "The existence of a tipping point implies that ice-sheet changes are potentially irreversible -— returning to a pre-industrial climate may not stabilise the ice sheet once the tipping point has been crossed," said Pattyn. The ice contained in Greenland and Antarctica contain enough frozen water to lift global sea levels several metres. The Greenland ice sheet alone has contributed 0.7 millimetres to global sea level rises every year since the mid-1990s. And the poles are warming faster than anywhere else on Earth, with Greenland alone 5C warmer in winter and 2C in summer since then. Although scientists predict it would take hundreds of years for them to melt even with huge global temperature increases, Monday's study provides further cause for concern with mankind's only realistic plan to avert runaway warming. The study warned against this approach, however, saying that a feedback loop set off by higher temperatures would "lead to self-sustained melting of the entire ice sheet" even if those rises were later offset. For Greenland, the team said with 95 percent certainty that major ice sheet decline would occur at 1.8C worth of warming. "For both Greenland and Antarctica, tipping points are known to exist for warming levels that could be reached before the end of this century," said Pattyn. What about methane increase from more and more drilling as the oil starts running out? Methane levels are steadily rising near north slope villages, much more than areas to the south. Far, far north of any putative melting permafrost which the global warming folks like to conflate with . . . DRILLING. Given that methane breaks down after a few years, that would seem to indicate more and more uncontrolled and continuous releases from exploratory drilling, fracking, or whatever else. Granted, the companies at play try to be careful but when push comes to shove there is apparently only so much they'll do to try and seal a gusher they started but can't capture. I have never heard one of these fake environmentalists mention drilling and methane. Throw enough money around and even scientists will tell you whatever you want to hear. Make it grant money and the idiots will conclude they are the ones gaming you. I am much more concerned about the release of methane from the destruction of billions of tons of clathrate deposits and destruction of permafrost. But the number of potential sources of increased GHG production as a consequence of increased warming in a positive feedback loop is truly frightening.